We attempted Leotheras the Blind during our Saturday raid. I have been very excited about our rate of progression. With two new raiders and a handful of under-geared players, we were still able to get him down to 5% on our last try. Taint, Sad, and I were playing Rockband and got this song before the guitar broke and we returned it. The first time I did vocals on it, I had to try and stop from laughing during the song. Sad was like "I've heard this song before." I was like this has to be the theme song for Portals. LOL. oooooh I'm still Alive.. Anyhow, we ended up returning the Rockband for Xbox and getting a PS3 and buying a Rockband for that system instead. Edit: No sooner than I post this that I discover GlaDOS is now available for the PS3. woot! Because we're going to be attempting Leotheras the Blind in SSC soon, Felix needed an FR enchant that required small prismatic shards. We had just run out. I don't know how I missed this in patch 2.2 but apparently you can get Nexus Transformation from any master enchanter. It breaks down Nexus crystals into Small Prismatic Shards and there is no cool down. Nexus crystals used to be the "void crystals" of pre-TBC raiding days. I had like 25 Nexus crystals stashed in my old bank from DE-ing all my old epic gear off my mage. That's the one draw back of your enchanter not being your main character...it's harder to keep up with the current enchants. I can't wait till they decrease the cool down or eliminate the cool down of void shatter. Well Blizzard has finally put their foot down. A new sign has been posted. NO NOOBS ALLOWED. It should make for a very interesting Season Four of Arenas. I had a lot to say about how Blizzard was going about Arenas in a podcast I have yet to publish....this adds a good new twist to it. No more complete PvP noobs running around in full Season 3 gear. Is this another slap in the casual players face? Is the standard non-serious team going to be dancing in the 1300s forever? I was just thinking today of the vast network of people who play the World of Warcraft. And much like the vast network of people across the world, we are separated pretty distinctly by zones of existence. Wouldn't it be nice if there was a frequent flyer mile pass you could use like once a month or so to go visit other areas of "our world" ? I'd love to be able to visit other friend and characters not on Boulderfist. Of course, I understand the potential snags of cross-server visitation. You'd have to be able to control any influx of gold to the server as well as any item smuggling. :) Also, hiring of people to boost your arena team or do a raid guide might give certain factions an advantage over others. But still, if in the global "real" world we're able to figure out rules and regulations to make it possible, I don't see why WoW can't figure something out as well. "Uh, sir? We're going to have to inspect you're [traveler's backpack]. Smuggling [Blackened Basilisk] is illegal. You could face a 10 day ban"
Tonight jae downed The Lurker Below in SSC. It is our second boss in SSC. It was our first attempt and only took us about 1.5 hours to figure it out. Not bad at all. I'm quite impressed what quality people can do over quality gear. It makes a huge difference. They all listen and learn fast. It's a nice quaint fight that has a little jumping fun. Once we figured out the tanking situation for the melee adds that spawn during Phase 2, we were set. Most important for phase 1 is to get out of SPOUTS. Other than that, cc and kill the adds during phase 2. I loved it because ranged DPS could go all out. There is no agro cap. That's always fun to watch! Yeah. So someone in our guild made this movie. When I first started watching it, I was like W T F.
And then I kept watching it and was like W T F.
After I watched it a second time, I started laughing like crazy. It's like a train wreck every time I see it in Ironforge. Two or more coordinated Night Elf males dancing. I just can't stop watching. It's so horrible and yet so awesome. Can you tell which ones are shamans in disguise? LOL. Over the last three weeks, I've been spending time with my folks as they were trying to quit smoking. (so far a success). During my time, I thought about addiction vs addiction. 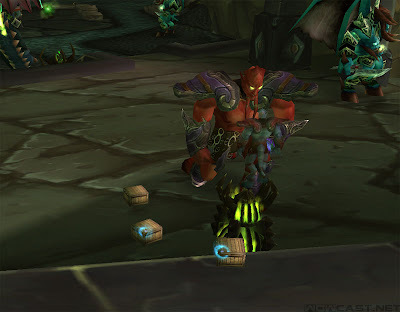 I heard some rumor that crack addicts have tuned to WoW to help over come their addictions. Probably not true but it seemed plausible. Anyhow, don't laugh but I got it into my head that I should teach my mom how to play wow. I mean she learns fast and she didn't actually oppose the idea of playing when I first mentioned it to her. And she seemed to really like the idea of playing the Auction House much like she loves to watch the stock market. So I took her to Walmart and she bought the game...although I tried to pay for it. She said she wanted to buy it. I told her about all the characters (alliance side). She seemed interested in gnomes. I let her watch the intro and she got to see the different character styles. I explained to her the super basics about healing and dps. "do you want to heal people or hurt people?" LOL. She's a registered nurse in real life so I wasn't surprised she wanted to play a healer. Unfortunately you can't be a gnome and heal. She hated the way the night elves and dwarfs looked. She didn't get to see draenei because we didn't buy the expansion pack. SOOoo.. she picked a human female. However I think she thought all of them looked retarded...and she's kind of right...Blizzard did a great job of making the humans look aloof. So she gets into the game and MAJOR ROAD BLOCK. ADSF?!??? Totally foreign concept to her. She's never played a computer game before...ever. She has no concept of movement or perception of control. It took us a while for her to get W and S down. Then she kept running straight into buildings. The hardest part however was getting her to understand how to control the camera view with the mouse. I kept thinking WoW should have some kind of tutorial for totally new players that gives graphics of the keyboard and mouse. It's just too much info to soak in. I let her talk to the first quest giver and she was like "I have to read all that?" Yeah. So it didn't go very well. I think she got frustrated with the movement part. But she did admit the game was artistically interesting. I think I'll try again later when I have more time with her. I just need to get her mobile enough to play the AH for me and be my AH stock broker. lol. I've noticed that the less I get on WoW, the less drama I have to deal with. LOL. Anyhow, I'm actually learning to deal with it all better..mainly by just becoming indifferent to people's retarded complaints. 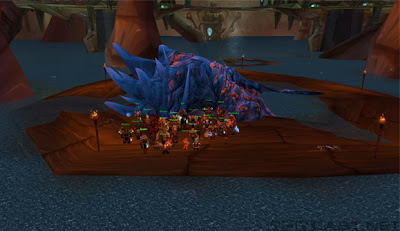 This week was our first week to get Gruul/Mag/Hydross down. Once we start to one shot each of those bosses, I'm going to see if we can't move on to one shot either Lurker Below or Void Reaver. Probably Lurker Below. In time, I hope that everyone in our guild will no longer need loot from Gruul's Lair and we can skip it all together and add two more bosses to our plate. It's amazing really because you always think that progression requires multiple days per week but somehow this group is managing. Obviously we have our limitations and we'll eventually be limited by time but it's still nice that casual players can see a little of new content. 5k gold in less than 5 weeks??? So I got this crazy idea to go on a gold farming spree. What if I did roughly 31 daily quests for 5 days a week using two characters? Do I have the discipline? We shall see. And if I can get multiple people to join in too, they should go a lot faster. I got this email from a fellow guildy the other week. I pretty much got biotched out cuz they were pissed that they didn't make the raid and they thought I somehow did it on purpose. Like there was some spite in my reasoning. At the time, the priority was first come/first serve so it was pretty obvious...or so I thought. Then I got a complaint about gear checks for the raid. Because apparently some people think it's okay for DPS to go into 25 man raids with 0 hit rating and less than 500 bonus damage. But the part that has bothered me the most about raid expectations is the complete and utter disregard to the other 18 people in the guild who have struggled for months to get geared and improve their craft. The whole "expect to be carried" things just annoys the crap out of me. "My gear is okay. It's all green but it's okay. I have no hit rating but I've been in the instance before so that should make up for it. Oh...and btw, I can't ever do Kara cuz I don't have time"
-----and yet it's somehow my problem. Yet you have to be careful about how much of their problem becomes the guilds problem. I don't want my drama to be the guild's drama. If everyone in the guild had to hear what I have to hear, they'd all just quit playing all together.. and that would be the exact opposite of the reason we started raiding in the first place.